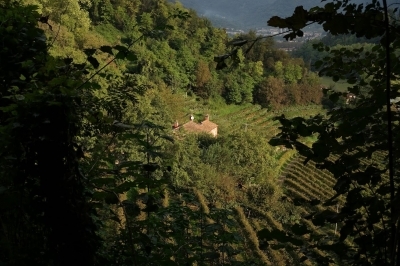 The Prosecco Hills of Conegliano and Valdobbiadene is part of the Tentative list of Italy in order to qualify for inclusion in the World Heritage List. One of the charms (or challenges) of visiting tentative sites is that the usual tourist infrastructure is missing. No visitor center, no heritage trails, little to no sign posting, no official website ... And worse, as it’s still a nomination neither the boundaries nor locations are finalized. So I was left wondering what the proposed site "Prosecco Hills of Conegliano and Valdobbiadene" entailed and what to visit. I found the nomination to be rather unhelpful in that respect. One site that is mentioned and that can be visited easily is the Convitto Scuola Enologica in Conegliano. It is based in a 19th century manor on the outskirts of town and supports to this day the local vineyards in growing the Glera grape. From there you can travel onward into the main hills between Conegliano and Valdobbiadene. I googled a bit and found a trail in Premaor, more or less in the middle of the region. So I hopped on a bus and went on a hike in the hills. The trail was poorly signposted (see above) so I missed out on a Chateau along the way and had to walk back along the main road (not so nice). After 2h I decided to call it a day and headed back to Conegliano. If the Piedmont Vineyards were the threshold, the Prosecco Hills should have been inscribed the first time around. The viticulture university offers actually some uniqueness. But I hope to have made abundantly clear in both my review and with my rating: I don’t think the Piedmont Vineyards belong on the list. And neither do the Prosecco Hills. It’s yet another run of the mill vineyard. But what I (and more importantly ICOMOS) consider as having no OUV has been of little importance to the WHC it seems. So I wouldn’t bet against the Prosecco Hills making the list eventually. Conegliano is well connected by train with Venice and the rest of Italy. If you are arriving from the Dolomites (Cortina), things get a bit trickier, especially on the weekend when no trains run, but plenty of car traffic goes in and out of the mountains. If you plan to get to the hills, plenty of busses run from Conegliano to the hills. Buying tickets on the bus is possible but more expensive. I couldn't figure out, though, where to buy the tickets otherwise. Conegliano is the usual nice and pleasant Italian town. If Venice gets way too expensive you could consider commuting from here by train. Another special place in Italy which, despite its beauty, tranquility and delicious product, may not necessarily be as "culturally" significant as Italy claims it to be. ICOMOS advised Not to inscribe; amendment to Inscribe voted against 9-12 in secret ballot (no 2/3 majority). Finally overturned to a Referral after much debate, including a Deferral amendment lead by Australia.